Preface (Á. Borja, M. Collins). Acknowledgements. Acronyms. Marine research in the Basque Country: an historical perspective (A. Rallo, Á. Borja). 1.1. Introduction: the heroic times. 1.2. The beginning of the scientific studies: from the 17th to the first half of the 20th century. 1.3. The growth in knowledge and the holistic approach: from the 1960s to the 1980s. References. Human activities along the Basque coast during the last two centuries: geological perspective of recent anthropogenic impact on the coast and its environmental consequences (A. Cearreta, M.J. Irabien, A. Pascual). 2.1. Geomorphological setting and historical background. 2.2. Physical destruction. 2.3. Chemical transformation. 2.4. Environmental regeneration. References. Section II. Geography and Oceanography. Geology and palaeoceanography (A. Pascual et al.). 3.1. Introduction: geological location of the Basque-Cantabrian Basin. 3.2. Morphology. 3.3. Geotectonic evolution: the opening of the Bay of Biscay. 3.4. Tectonics: deforming structures. 3.5. Evolution of the Bay of Biscay: palaeoceanography. 3.6. Natural resources (gas, oil) on the continental shelf. References. Climate and meteorology, variability and its influence on the ocean ((J.I. Usabiaga et al.). 4.1. Introduction. 4.2. Climatic classification. 4.3. Climatology. 4.4. Special atmospheric events over the area. 4.5. Relationships between ocean and atmosphere. 4.6. Interannual variability of climate. References. Sediment supply, transport and deposition: contemporary and late quaternary evolution (A. Uriarte et al.). 5.1. Introduction. 5.2. Hydrological regime of the Basque Country. 5.3. River basin characteristics. 5.4. Fluviatile sediments inputs. 5.5. Estuarine and shelf transport. 5.6. Regional sediment transport: a synthesis (conceptual model). 5.7. Quaternary evolution of the Basque coast. References. Marine dynamics ((M. González et al.). 6.1. Introduction. 6.2. Wave climate. 6.3.Water level fluctuations. 6.4. Currents. 6.5. Nearshore waves, littoral processes and coastal structures. 6.6. Model outputs for pollutant dispersion. 6.7. Concluding remarks. References. Hydrography of the southeastern Bay of Biscay (V. Valencia et al.). 7.1. Introduction. 7.2. General hydrography of the estuaries along the Basque Country. 7.3. General hydrography of the coastal water masses. 7.4. Estuarine and coastal hydrographic features determining water quality. References.Section III. Chemical Oceanography and Water Quality. Main characteristics of the water masses (V. Valencia, J. Franco). 8.1. Introduction. 8.2. The estuaries of the Basque Coast: descriptive properties and case studies. 8.3. The main water masses characteristics of the Basque Coast. References. Contaminants in estuarine and coastal waters (M.J. Belzunce et al.). 9.1. Introduction. 9.2. Sources of contaminants. 9.3. Parameters determining the behaviour, pathways and fate of contaminants. 9.4. Concentrations of contaminants. 9.5. Long-term evolution of metal contamination. 9.6. Quality objectives. References. Microbiological quality (J. Bald et al.). 10.1. Introduction. 10.2. Origin and source points of microbiological pollution. 10.3. Problems associated with the microbiological pollution. 10.4. Legislative framework for microbiological pollution survey. 10.5. Evolution and actual situation of microbiological pollution along the Basque coast and estuaries. References. Section IV. Sediment Characteristics, Quality and Chemistry. Characteristics of estuarine and marine sediments. (A. Uriarte, M.J. Belzunce, O. Solaun). 11.1. Introduction. 11.2 Sedimentological analysis. References. Contaminants in sediments (M.J. Belzunce et al.). 12.1. Introduction. 12.2. Geochemical analysis. 12.3. Anthropogenic influences of contaminants in the sediments. 12.4. Methods using for establishing sediment quality values. 12.5. Distribution of contaminants along the Basque coast. References. Section V. Biomonitoring. Biomonitoring of heavy metals and organic compounds, at the tissue-organism level (Á. Borja et al.). 13.1. Introduction. 13.2. Methodology. 13.3. Contaminants in molluscs. 13.4. Background levels of heavy metals and quality values in molluscs. 13.5. Conclusions. References. Biomonitoring of environmental pollution along the Basque coast, using molecular, cellular and tissue-level biomarkers: an integrative approach (I. Marigómez et al.). 14.1. Introduction. 14.2. Molecular, cellular and tissue-level biomarkers. 14.3. Case studies in the Basque Country. 14.4. Concluding remarks: design of monitoring networks based on the 'biomarker' approach. References. Section VI. Communities and Ecology. Bacterioplankton and phytoplankton communities (E. Orive et al.). 15.1. Phytoplankton assemblages. 15.2. Phytoplankton biomass. 15.3. Phytoplankton biomass size distribution. 15.4. Detection of phytoplankton assemblage structure by means of pigment signatures. 15.5. Phytoplankton production. 15.6. Bacterioplankton biomass and production. 15.7. Role of phytoplankton and bacteria in the overall microplankton metabolism. 15.8. Herbivorous versus microbial food webs. References. Zooplankton communities (F. Villate et al.). 16.1. Introduction. 16.2. Characteristics of shelf and estuarine communities. 16.3. Spatial and temporal patterns. 16.4. Feeding and reproduction. 16.5. Biochemistry. References. Ichthyoplankton assemblages (L. Motos et al.). 17.1. Introduction. 17.2. Historical review. 17.3. Ichthyoplankton assemblages along the Basque coast. 17.4. Ichthyoplankton studies undertaken in the Bay of Biscay. 17.5. Vertical distribution of fish eggs and larvae in the Bay of Biscay. References. Benthic communities, biogeography and resources management (Á. Borja et al.). 18.1. Introduction. 18.2. Biogeographical aspects. 18.3. Main benthic communities. 18.4. The exploitation of benthic resources and its management. References. Coastal fisheries and demersal estuarine fauna (L. Arregi et al.). 19.1. Introduction. 19.2. Small-scale coastal fisheries. 19.3. Pelagic fisheries. 19.4. Biology of the main target species and related environmental aspects. 19.5. Demersal fauna in estuaries. References. Seabird populations (J. Franco et al.). 20.1. Introduction: main features of the Basque coast, in relation to seabirds. 20.2. Breeding seabirds of the Basque coast. 20.3 Migration and wintering of seabirds along the Basque coast. References. Biodiversity and conservation of wildlife and natural habitats (R. Castro et al.). 21.1. Introduction: the international legislative framework. 21.2. Experience in managing marine biodiversity in the Basque Country. 21.3. Distribution and threats to marine habitats. 21.4. Species of interest. References. Recovery of benthic communities, in polluted systems (J.M. Gorostiaga et al.). 22.1. Introduction. 22.2. Monitoring programmes: evaluating changes. 22.3. Recovery trends. 22.4. Simulation of recovery processes. References.Section VII. Overall Assessment. Overall Assessment - human impacts and quality status (J. Franco, Á. Borja, V. Valencia). 23.1. Introduction. 23.2. Assessment of human impacts: issues of main importance. 23.3. Monitoring programmes to assess the quality status of the marine environment. 23.4. The WFD and the monitoring of estuarine and coastal waters quality. 23.5. The actual ecological quality of the Basque coast. 23.6. Future scenarios in terms of water quality along the Basque coast. References. Conclusions: Notes on a research agenda for the region (M. Collins, Á. Borja). 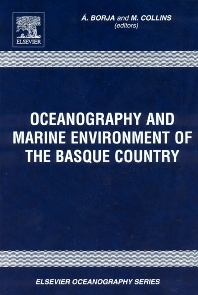 Against a background of extensive multi-disciplinary oceanographic investigations over a number of years, together with the long-term establishment of a Society and Institute, extensive information is available from studies undertaken in the estuarine and coastal waters of the Basque Country. The present authors gained access to unpublished literature and reports which, together with a synthesis of internationally-refereed papers, provide a series of scientific overviews of particular subject areas. Teams of researchers (from Basque Institutes and Universities) combine to present the present 'state of knowledge', within a global context, of processes ranging from sub-seabed to air-sea interaction - incorporating data on the associated biology (including fisheries) and pollutant sources and levels. The latter are compared with regional, national and European legislation. The volume is divided into various sections: Introduction; Geography and Oceanography; Chemical Oceanography and Water Quality; Sediment Characteristics, Quality and Chemistry; Biomonitoring; Communities and Ecology; and Overall Assessment. The topics covered include: an historical review of marine research; the impact of human activities, during past centuries; geology, geomorphology and sediments; climate and meteorology; marine dynamics; hydrography; water mass characteristics; contaminants in the waters; microbiological quality; sedimentological characteristics; contaminants in sediments; biomonitoring of heavy metals and organic components, at tissue organism level and using cellular and molecular biomarkers; bacterioplankton and phytoplankton communities; zooplankton communities; benthic communities; seabirds; biodiversity and conservation; recovery of benthic communities; the polluted systems; and assessment of human impacts. On the basis of these syntheses, future challenges for marine research in the Basque Country are identified, in terms of a 'Research Agenda'. This comprehensive text, relating to estuarine, coastal and oceanographic processes at wide-ranging spatial and temporal scales in the southern Bay of Biscay, will be of interest to researchers, engineers and legislators - on a regional basis and within a world-wide perspective. Academics, graduate students, researchers and legislators in oceanography and marine sciences.